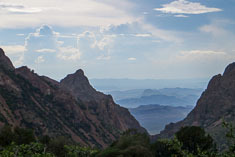 I knew very little about either Big Bend National Park or west Texas when John met me at the airport to pick up his rental car and we headed west out of town. I was the navigator and before we had even left the city limits I navigated us to a wastewater pond right along the freeway where a Black-bellied Whistling duck (which would be a life bird) had been reported on eBird. It was no longer present but we did see a close-up Green heron and met a Mockingbird, the first of many. 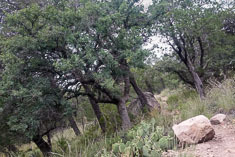 We continued up into the hill country, a low-relief region of rolling hills and small plateaus characterized by juniper grassland and sandy brown limestone road cuts. I would not have guessed it could be so green having only seen it in the midst of the drought several years ago. John graciously suggested a couple of other birding stops but having covered the area pretty thoroughly last time I declined. We did stop at a farmers market, a couple of dozen canopied stands selling everything from candles to bison in a grassy lot along the road. The peaches were small and fragrant and sweet, the tomatoes hard and tasteless, but the real surprise was the bread - hearty whole-grain loaves from a local bakery. We had not expected such bread in Texas and we stocked up. We could have bought a whole bison too for $2000 but didn't think we could fit it in the trunk. as cheap as they were flavorful. 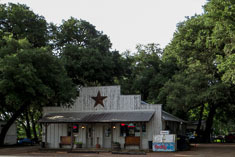 After dinner we drove around town admiring the old spreading oaks and the second story wraparound porches before continuing west to Fredericksburg. Though John generally camps it was getting late so I suggested a motel. 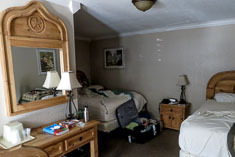 We found a quiet and comfortable room at the Country Inn & Cottages for only $58. Eminently spouseworthy, it was furnished with rustic wood chairs and dressers and a very nice walk-in shower. I'd expect to pay twice that for a comparable room anywhere in Washington. On Big Bend day 2 we still didn't quite make it to Big Bend; it's a long drive from Austin. 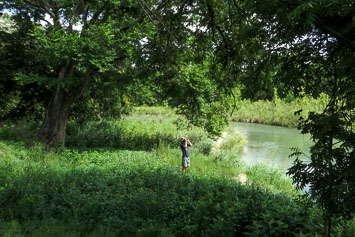 I wanted to at least sample the birding in this verdant country we were driving through and eBird reported a Green Kingfisher in South Llano River State Park near Junction towards the west edge of the hill country. That would be a life bird for me since I didn't see it on my last visit and John agreed enthusiastically that we should try to find it. We arrived at the visitor center to find a horde of juvenile hummingbirds crowding the feeders. 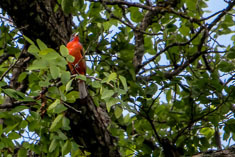 They could have been either Black-chinned or Ruby-throated. Inside we collected maps and pamphlets and got directions to a three mile walk through oak-pecan grassland along the river. Already at 10 AM it was hot out there. Our path disappeared into waist-high and presumably chigger-infested grass before it reached the river. Undeterred, we forged on. 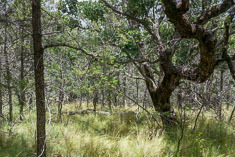 When the path reappeared John spotted a beautiful red yellow and black banded snake lying in the trail. "Not to worry", I told him. "Red on yellow harmless fellow, red on black watch out Jack." Having memorized that little saying during my naturalist phase back in high school, I'd been waiting all my life to use it. 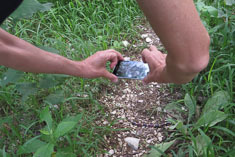 John stooped down to get some close-up shots as the snake slithered into the grass. Perhaps he knew all along but it wasn't until about three weeks later that I realized that I had the little saying exactly backwards. The colorful snake with red bands outlined in yellow was a Texas coral snake, one of the most venomous reptiles in North America. 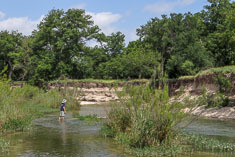 warm South Llano River to rinse off the chiggers. It must have worked because I didn't end up with any bites. On the way out of the park we stopped at the bird blind. 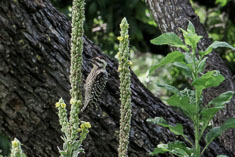 With running water and bird seed in a natural looking yard fronting a little hut with benches and picture windows and slots for camera lenses, it was similar in design to the blind I frequented at Pedernales State Park on my last visit. It would've been great for photos were not for the tiny fire ants defending the place against visiting photographers. 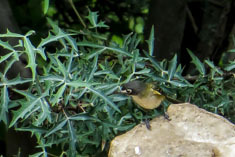 As it was I photographed a few sparrows, a bathing Yellow-breasted Chat and what I thought was a Lesser Goldfinch which turned out to be an endangered Black-capped Vireo instead. 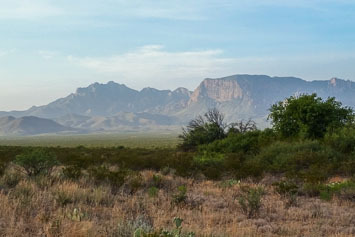 I could've easily passed another day birding there but Big Bend was calling, though not so loudly that we couldn't stop for milkshakes on the way out of town. Like milkshakes everywhere they were too cold, too sweet and too large and we drained them anyway. By sunset we were in the desert. 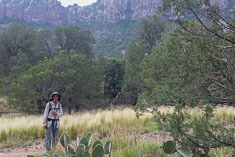 The gradual changes of plant communities, geology and topography along the way were fascinating. 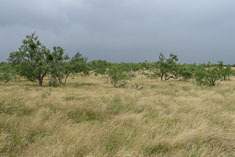 Oak and juniper woodlands yielded to mesquite grassland then the grass was replaced by scrubby bushes. 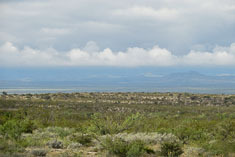 About the time we crossed the Pecos River we saw our first creosote bush. 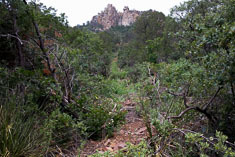 Plateaus became broad uplands which began to be dissected into mesas. Roadcuts grew into cliffs which here and there revealed strange deformations in the limestone - columnar solution cavities filled with reddish brown clay, regular layers abruptly broken into blocky breccias for a few tens of feet, even an occasional fault. 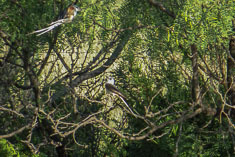 Gray Scissor-tailed flycatchers with rosy flanks and long streaming tails frequented the roadside fence lines. 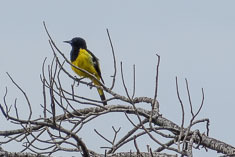 Outside Iraan (pronounced Ira-Anne not Iran) we saw a bright orange Bullocks Oriole and ran scary low on gas, ironic since we were in the midst of an oilfield with the scents of raw petroleum and sulfur compounds wafting across the highway. They call the pumps "Texas grasshoppers". 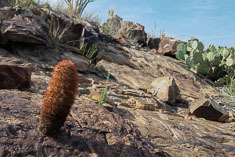 Outside of Marathon we stopped to admire flowering agaves and to investigate a road cut in which interbedded layers of marble and black chert were folded almost in half. As we were walking the roadcut I heard an angry whine. Twenty feet ahead of us a growing cloud of bees was buzzing around a vertical crack in the rock. 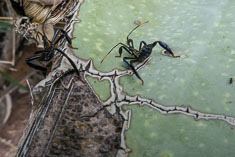 "Killer bees nest in cracks like that" I thought. "Killer bees" I shouted. "Back up!" We did, and the bees calmed down again. John didn't seem too concerned; I think he was absorbed in trying to puzzle out the history of the rocks. 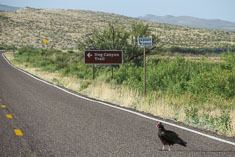 South of Marathon after sunset, traffic was sparse and we began to encounter critters on the road. Every few miles we had to slow down to avoid jackrabbits, poorwills and snakes. I'm afraid we actually ran over a tarantula. 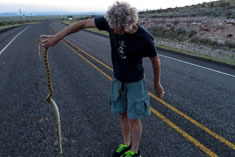 We shooed a snake or two off the pavement and John carried another one off, a mortally wounded 5 foot long Gopher snake. A Great Horned owl carried a snake off the road in front of us too, while a young owl waited on a nearby fencepost for its share. Not until it was nearly dark did we start thinking about where we might sleep for the night. The nearest campground was yet an hour away and all the side roads seemed to be blocked by locked gates. The first open road we tried turned out to be someone's driveway and I fully expected them to emerge from the double-wide mobile with a loaded shotgun but they apparently didn't notice us. The second ungated gravel road was more promising. It had been recently graded and we figured we could cross the line of dirt piled up by the grader and sleep on the shoulder but a mile in we came to a smooth-floored dry wash. We backed into it and laid out our bedrolls on hard-baked gravel under the full moon. Neither border patrol nor local ranchers visited us during the night though a loquacious Mockingbird (is there any other kind?) serenaded us periodically while the Big Dipper rotated like the hand of a clock around the North Star. 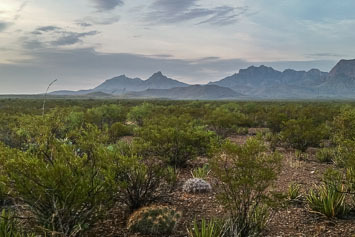 We awoke to the dusty fragrance of creosote bush. John brewed coffee on his propane stove in the pre-dawn light then parked his camp stool in the middle of the road to watch the sun rise while I wandered around looking for birds and a place to poop. 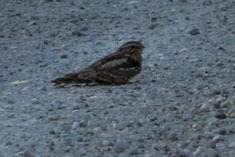 I found both, but not umtil we were on the road again was I able to identify the source of the guttural chortling we heard periodically - Greater Roadrunners. 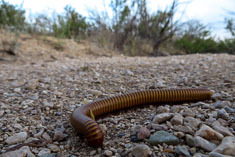 They were ubiquitous in Big Bend. 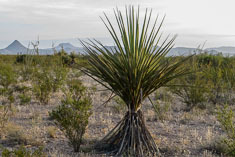 The desert where we camped was brushy but open, dominated by creosote bush with acacias and several other woody shrubs, Ocotillo, yucca and some cholla I think. Underfoot was a mix of partly dried forbs still tinged with green. 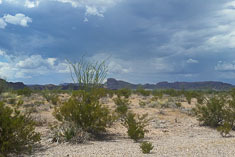 Like the grasslands we passed through yesterday, the desert everywhere just felt green even where on closer inspection browns seemed to predominate. 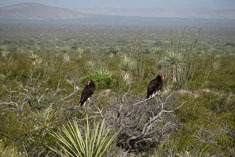 Turkey vultures welcomed us into the park. They were perched on bushes and fence posts and even in the road, sitting in the sun as if to recharge solar batteries before taking to the air. Their day's work was scattered along the highway battered and flattened by cars passing in the night. 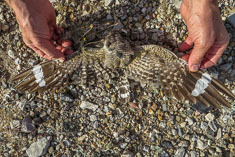 The snakes, jackrabbits, rodents and birds (even a Lesser Nighthawk) weren't going anywhere so the vultures didn't need to hurry. We on the other hand had places to go and things to see but were not in too much of a hurry to stop for the turkey vultures, which posed long enough for me to photograph them, and a Chihuahua Raven, which did not. That was too bad because they are not common in the park and I've never photographed one, but it was crow-sized with a stout bill and even a bit of white showing on the side of its neck. We stopped at the visitor center to check in. 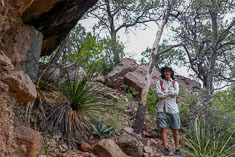 We learned that that Chisos Mountain campground was full so we procured a primitive site obscurely named "Paint Gap #1". The ranger soberly warned us that our rental car was inappropriate but might be able to get us to our campsite nonetheless. There we were to store all of our food and toiletries in the provided bear box; we should park on the right side and set up our tent on the left side of the site and we should bury our poop without the tp at least 200 yards from the camp. Paint Gap #1 was our site for the duration of our stay and we were not to camp anywhere else. OK, we soberly agreed. 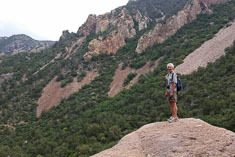 The Chisos Mountains with their Lucifer hummingbirds and their Colima warblers loomed above us, beckoning, but it seemed to me that a half day would not be sufficient to explore them so we headed down towards Rio Grande Village and the river instead. 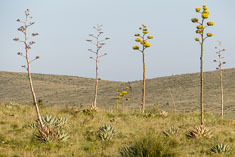 Halfway down a long bajada slope of pastel green desert scrub fading into soft blue mountain silhouettes on the horizon, a sign on the right said "Hot Springs Resort". "High clearance recommended". Where hot springs are involved, John's attitude is (to paraphrase a famous military officer) "damn the clearance, full speed ahead", so we proceeded gingerly down the road, which really wasn't that bad, to the ruins of a hot spring resort on the banks of the Rio Grande less than 200 feet from Mexico. 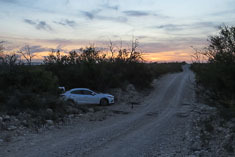 We followed a bleached gravel path past a couple of dilapidated stone buildings and two picnic tables nestled under a clump of palm trees and through a dense band of carrizo cane to the river. The sun was plenty hot but there were no springs in sight. 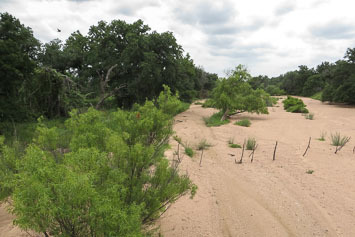 The river consisted of three channels between gravel bars, the gravel having been deposited by a wide wash entering from the right between banks of dense mesquite and acacia. 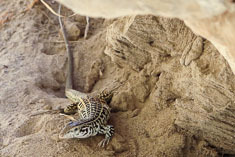 A trickle of warm clear water meandered down the wash, its shallow pools full of tadpoles. Later I found one pool upstream deep enough (like 10") to bathe in, without soap of course. 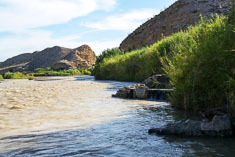 We waded into the warm muddy Rio Grande. The footing wasn't bad where the water was moving but wherever it was still, as in the pool upstream, the bottom was mud with the slimy consistency of axle grease. 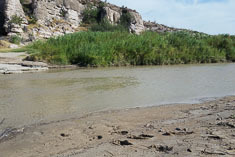 The channel on the Mexico side carried the most water. It was mid-thigh deep with rounded boulders underfoot. 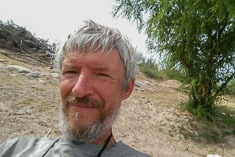 I waded carefully across and took a photo of myself on my Mexican vacation but didn't linger because I didn't want to meet anyone and I wasn't sure that the trash-strewn stick and thatch shelter on the riverbank was unoccupied. From Mexico though I spotted the hot springs, a low square stone-walled enclosure right at the river's edge downstream a couple hundred yards on the US side. We walked down to investigate. 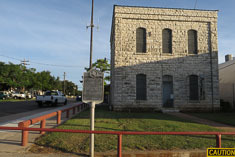 The springs sit at the base of a bluff composed of thin-bedded limestone and sandstone. The water was clear and warm, 105F, and tasted faintly of sulfur. Where the heat originates I don't know. 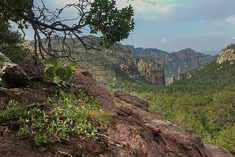 Though much of the rock in Big Bend Park is volcanic, it isn't recent. 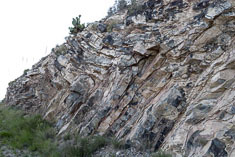 Basin and Range faulting is still active within the park so maybe friction on the fault generates the heat. We claimed one of the picnic tables and fixed lunch. Cheese, bread, mayo, avacado, tomato, cucumber and oranges, like yesterday. The air temperature was approaching 100F but a light breeze kept us comfortable as long as we followed the shade. Cicadas buzzed in the Mesquite. After lunch I birded up the wash while John napped on the picnic table. I wanted to see more Varied buntings. 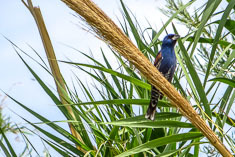 I'd spotted a pair as soon as I got out of the car and found more down by the river, dark purplish-blue finches singing in Mesquite and rushes. They responded instantly when I played a Varied Bunting song on my phone and I was even able to get some photos. Reviewing the photos later in the afternoon though, I wondered why they didn't show any red on the nape and realized that I was not looking at Varied Buntings but rather at Blue Grosbeaks. Nice birds but not nearly as exciting as Varied Buntings. Though I accumulated a pretty good list I never did find any varied buntings. 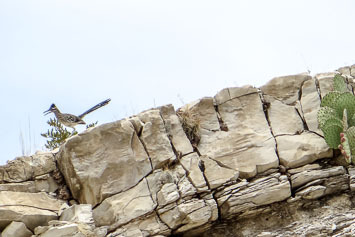 I had families of roadrunners and ravens, lots of doves, a pair of Yellow-billed cuckoos and two Crissal thrashers. My most exciting sighting was not a bird but an adorable wide-eyed Bobcat kitten, golden brown with oversized ears, black rings on its legs and an unexpectedly long black-tipped tail. It and a sibling were playing at the edge of the wash while Mama glared at me from the brushy bank. While I fumbled with my camera they faded into the thickets. of the afternoon. 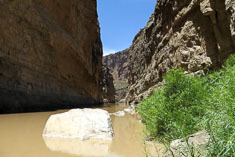 While I explored upstream and downstream I stayed mostly in the wash. 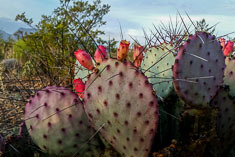 The abundance of cacti of various kinds, along with the persistent spines of long dead cacti scattered around on the ground, made walking on the uplands a treacherous affair. The spines easily penetrated both soles and uppers of my running shoes (let alone my flip flops) and avoiding them required constant vigilance. 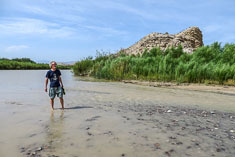 It must be really tough for the illegal immigrants, whose tracks I found emerging from the river a few hundred yards downstream from the hot springs, to have to hike for miles through the desert facing heat by day and thorns by night. Towards evening John recovered enough to attempt the 50 yard trek back to the car. We made it but at the first sharp turn he was overwhelmed by nausea and had to stumble out of the car to throw up along the road. I drove carefully down the Rio Grande village attempting to follow as straight a line as possible. We were looking for a ginger ale but the store was closed and the vending machine didn't work. 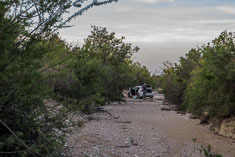 When at dusk we reached our assigned campsite along the gravel Paint Gap road, it was occupied so we continued down through the creosote bush to Paint Gap 2, by a patch of tall Mesquite bushes at the foot of the Paint Gap? Hills. As we were setting up camp there the rightful owners showed up in a van with kayaks on top so we yielded the best spot to them. Relocating, I inadvertently parked on top of an anthill. Though I pulled ahead 10 feet or so when I realized my error the ants did not forgive me. Wherever I went they sought me out and soon found me, clambering up onto my flip-flops to sting my feet. I stomped on them and later realized that was the problem. The scent of the squished ants on my flip-flops broadcast my location to squadrons of their colleagues intent on revenge. Setting up the tent was a pitiful affair but I wasn't about to allow irritated ants free access to my bed overnight. Somehow we got the tent up despite John's nausea and my dysfunctional arms and hands. A moon as bright and remote as God traced a high arc across some of the darkest sky in the continental US while we slept. 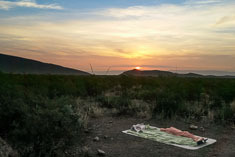 John wasn't up to breakfast so he slept in while I grabbed some granola and went birding out in the desert as the sun rose behind the Paint Gap Hills. 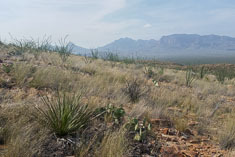 The creosote bush desert around our camp wasn't as treacherous as the low desert around the hot springs had been. 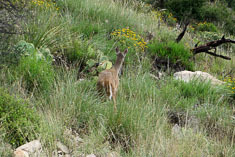 In addition to 22 species of birds, I saw Mule deer and Black-tailed jackrabbits and lots of desert cottontails. Back in camp neither John nor the ants were up yet. John had set up my pad as a sunshade in the tent and was happy to sleep for another hour or two so I went back out birding. This time I followed the Paint Gap road north over a low pass and into a brushy canyon which I scrambled across to reach a low dry waterfall. That was quite a birdy spot with Scott's orioles, Canyon wrens and towhees and Rufous-crowned, Black-throated and a family of four Cassin's sparrows. 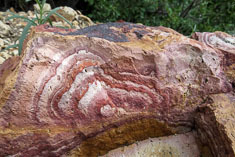 The bedrock showed interesting patterns of concentric bands of light and dark oxidation along fractures. Up above the lip of the ledge I discovered what was attracting the birds, a small pool of water left by recent rain showers. Nice Ocotillo grassland habitat up there too. John was up when I returned to camp, and he was even up to fixing pancakes for lunch. "It's good to have you back again" I told him. A ranger drove up in a white pickup truck to check our permit. We explained our reason for being in the wrong site and he promised to evict the squatters from Paint Gap #1. We felt a bit sorry for them and I in particular felt in their debt for giving me the opportunity to bird the richer habitat around Paint Gap #2. 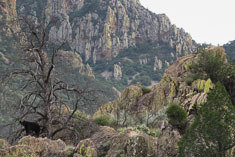 We took our time eating and packing up then drove up into the Chisos Mountains to check out the campground and go for a hike. 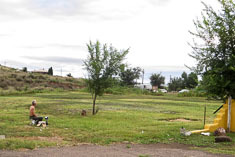 The campground was too crowded for our taste even though the surrounding brush land offered appealing bird habitat. 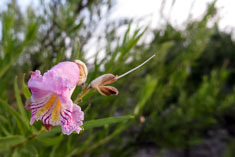 For our hike we decided on the Laguna Meadows trail. 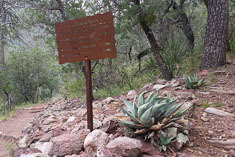 John would start out with me and go as far as he could, which turned out to be the height of land on the Colima trail. I had hoped for warblers but we saw none, though we did have quite a few other birds. Where the trail starts to climb up to the pass, we traced a path of destruction left by several large boulders where they had tumbled down the mountainside a year or two earlier. 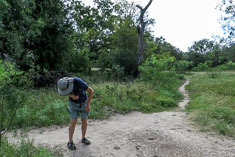 They had left craters 5 feet across and 2 feet deep on each bounce and had sheared off tree limbs up to 20 feet above the ground. Every tree directly in their path had been snapped off or shattered. 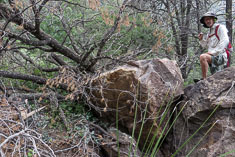 One of the largest boulders had broken into three pieces when it hit the bottom of the gulch, with the largest piece then bouncing three times up the other side and landing squarely in the trail where rangers had had to blast it out of the way with dynamite. It must've been quite a sight. On a ridge to the right as we approached the height of land on the Laguna Meadows trail a huge flat boulder protruded from the slope. 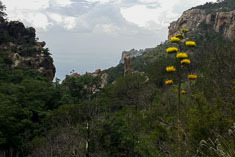 Though I wanted to check it out anyway, a thunderstorm coming our way gave us an extra incentive to reach it. Bushwhacking over there was not easy. 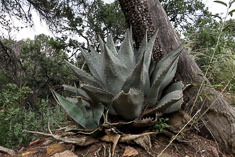 The oak trees were well spaced but scrubby bushes and large yuccas impeded our progress and small but fierce little agave plants threatened seriously unpleasant consequences should we run into them or God forbid, slip and fall on their formidable spines. With the thunder getting closer we took shelter under the giant rock and ate a lunch. Each time we saw lightning we counted seconds. Only one bolt was really close. The crack of thunder from that one so startled me but I completely forgot my count but John said it was only a few seconds away. We puzzled over how the boulder had gotten there and how long it might've been there. There were no cliffs above it from which it could have fallen and in any case it was deeply embedded in the host alluvium. We concluded only that it must have been there a very long time. Sometime during the day it had rained at Paint Gap #1. Fat ribbons of brown mud marked the low points where the road crossed little washes and humidity hung in the air like smoke. Thin rings of flotsam outlined the borders of ephemeral puddles in our campsite. 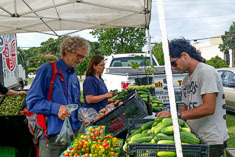 The forecast called for a slight chance of rain but the afternoon storms had dissipated as the sun had set leaving gauzy skeins of altostratus off to the south, where any new weather would come from. John heated up a can of beans with some yellow squash for supper. We sat and talked until dark. Laying out my bedroll, I noticed a few gnats bouncing off my headlamp. John set up his bivy sack and crawled in, zipping the mosquito netting closed over his head. "Hey I've got a bunch of bugs in my tent", he called out. He was reading something by the light of his headlamp. 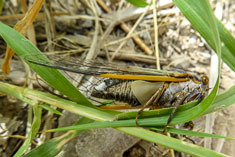 When I went over to check it out I found a seething mass of gray gnats the size of a dinner plate on the outside of the mosquito netting centered over his light. I looked down at my coat and it too was alive with little insects. 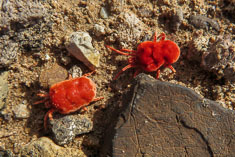 Hordes of them landed on my blanket as I finished laying out my bedroll by the light of my headlamp. Hoping to divert them from my bed I set my headlamp some distance away and took a five-minute walk down the road in the dark. Returning I found the ground around my headlamp crawling with bugs so I turned it off. At least they weren't biting, I reminded myself as I lay in bed feeling little critters creeping around on me. I was so tired that I went to sleep anyway. In the morning my blanket was frosted with dew and my sheet was peppered with dead gnats. The air was hazy and still and the clouds overhead seemed not to have moved since sunset the night before. 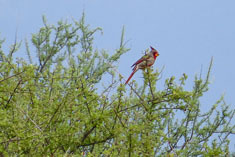 Mockingbirds and Black-throated sparrows serenaded the sunrise, the latter with a song of thin whistles and delicate trills ending alternately on up and down notes. 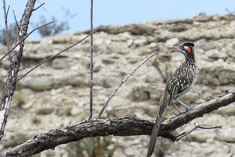 From time to time a roadrunner chortled and a couple of distant Scaled Quail called "kek keh-yiir kek keh-yiir" to each other. We lingered in camp until the sun was well up then drove up into the hills for another day of hiking. I was looking for my two target birds, the Lucifer hummingbird and the Colima warbler, and I didn't know whether to be optimistic or not about my chances of finding them. 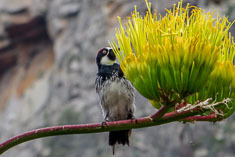 Having read somewhere that the hummingbird liked agaves, I examined every flowering agave on the way up the Pinnacles trail. No hummingbirds. 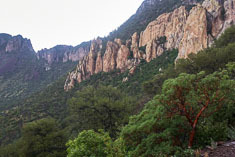 On the other hand, when we reached the pass over the shoulder of Emory peak and started down the Boot Springs trail I immediately heard a Colima warbler song. 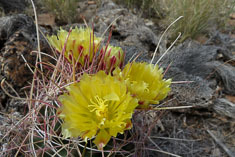 I lingered there in hopes of seeing it while John took off to do his loop hike around the southeast rim. Unfortunately the warbler did not show up so after waiting 15 minutes I followed John down the trail. 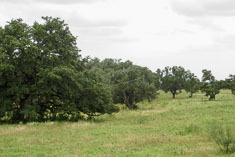 Yesterday I focused my warbler search in areas where oaks (and other?) hardwoods predominated but today I didn't hear another Colima singing until I entered a mixed woods of older oaks and relatively small juniper trees. The bird was singing rather infrequently from several different places so I parked myself on hillside in the center the area and dug out some lunch to eat while I waited for it to appear. 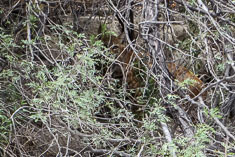 Ten minutes later I spotted it foraging in a tree and got a brief look but no photos. 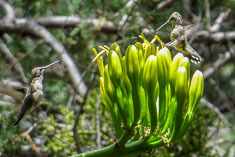 I did get photos of a couple of Black-chinned hummingbirds around a nearby flowering agave. Hiking back down Boot Springs I came across another Colima and had great close-up views but couldn't get my camera out in time. That was my last photo opportunity. Forever. 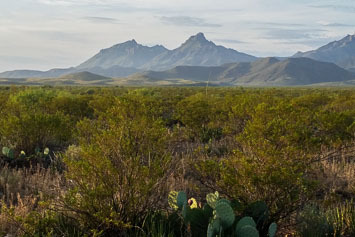 By the time I make it back to Big Bend, if I ever do get back (and it would have to be in the next year or two before my legs become paralyzed too), my hands and arms will be completely useless. Best not to spend too much time thinking about that. Everything I do this trip is for the last time. The next hour was one of those special times in birdwatching that don't happen very often. 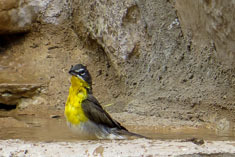 I checked out the spring, actually an algae-choked stream, and found a couple of Cordilleran flycatchers. Not far back along the Boot Springs trail I had a nice close-up Rufous-crowned sparrow and then a pair of Painted Redstarts, all black with a bright red belly and a bold white wing patch. They're not common in the park and it was a privilege to see them. The last time I saw them was in the California desert 30 years ago. 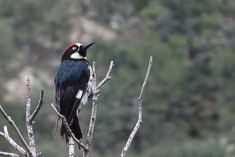 Next up was an Acorn woodpecker poking around, and posing, in a yellow agave flower cluster. I got photos! The real prize though was a female Lucifer's Hummingbird right along the trail. She even perched for 30 seconds within six feet of me. Unlike many female hummingbirds, the Lucifer's is quite colorful with rich buff color on her face, breast and flanks and a noticeably down-curved bill echoed by a dark stripe curving back behind her eye. She was my only Lucifer's of the trip but she was sufficient. A thunderstorm over Emory peak forced me to take shelter under a slanting ledge for about 20 minutes. 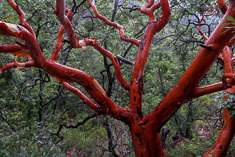 The typically dry oak juniper woods was humid and fragrant afterwards and the rain-rinsed Texas Madrone trunks bright orange. John caught up to me about halfway down the trail. He'd taken some spectacular photos of the storm from the Southeast Rim. Rather than stopping he draped his wind shell over his head and pack and kept hiking. The fact that he wasn't struck by lightning may or may not be evidence that God approves of his theology. John fixed ramen with zucchini for supper. No elegant restaurant meal ever tasted better. I drank the third of my four beers. I'm one behind and will probably take it home with me. The evening was cloudy and warm, the air still and muggy. 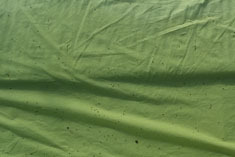 Not wanting to take a chance on the rain I set up the tent and lay on my bedroll bug-free but sticky with sweat for quite a while before falling asleep. Though it seemed to stay cloudy and dry most of the night, in the morning the tent was very wet. 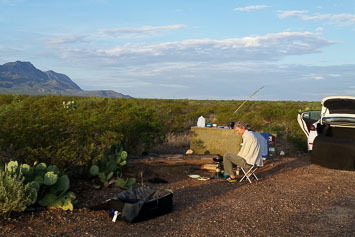 John fixed pancakes again and we enjoyed breakfast and coffee while our tents and bedding, draped over creosote bushes around camp, dried out in the warm morning sunlight. This was our last morning in the desert and we were in no hurry for it to end. Before packing up, I took a few minutes to explore the shallow wash hundred yards or so to the west of camp. A particular tall cut-leafed forb was thriving along the wash so I picked some and used it as a natural alternative to tp. 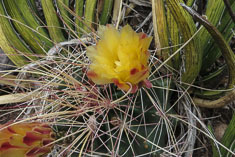 It was one of the few plants out there with leaves large enough for that purpose. And even a little fuzzy too. I could have perhaps wondered why the local rabbits didn't seem to touch it, but I didn't. My diaper rash finally cleared up a week later. We'd been geologizing the whole trip, but today was dedicated to it. 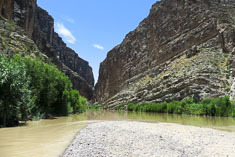 We drove the road down to Castolon and Saint Elena Canyon, stopping at geology sites both marked and unmarked. Under the alluvium, most of the rocks we saw were tertiary volcanics - intrusive rhyolite domes and dike swarms, ash falls and reworked volcanic sediments. We came up with stories as to what had happened and sometimes the experts even agreed with us. 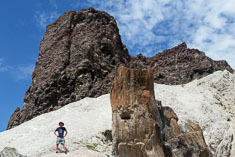 One of most interesting formations consisted of a couple of volcanic necks protruding like trunks of giant petrified trees from a bright white ash deposit. Inspecting them closely, we recognized that their linear and almost fibrous texture was not derived from wood but we were still hard-pressed to see them as the roots of miniature volcanoes. 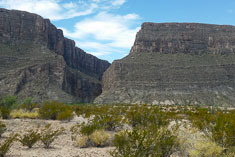 Approaching the river, we marveled at the thousand foot wall of limestone which is also the face of the great normal fault on the southwest side of the Big Bend graben. 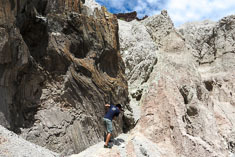 We noticed several areas where the regular bedding was interrupted by what appeared to be slabs of massive limestone and theorized that they were probably formed within the fault when huge slices of rock had been sheared off and recrystallized. We stopped briefly at the Castolon store for some cold water. The low stucco building, the stout storekeeper shooting the breeze with a couple of buddies on the covered porch outside the front door, the dark and rather spare interior with dusty ceiling fans turning overhead and strips of flypaper hanging from the ceiling (OK I made up those last two details), felt timeless, far removed from the world of internet and jet travel and perhaps even the automobile. 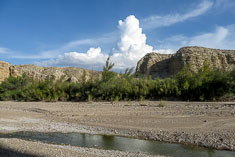 We bypassed the closed Cottonwood Campground though I would have loved to spend a couple of hours birding there but took time to do the short hike into Saint Elena Canyon. Viewing the Canyon at sunrise had been one of John's objectives for the trip. At midday it was hot. 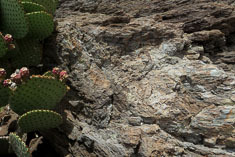 Fragments of shells and lenses of glossy black chert were embedded in the gray limestone. Two small faults, one on each side of the canyon, extended partway but not all of the way, up the canyon walls. Not only that, but they were trending in different directions. How did that happen? We ate lunch at a picnic table in the partial shade of a Mesquite tree by the parking lot, displacing two young women who were traveling together to LA and looking for swimming holes. "Good luck with that", we thought, and wished them success on their trip. The sun was bright and hot. 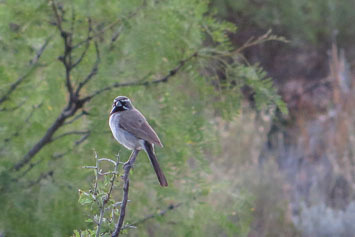 Blue grosbeaks and Bell's vireos sang in the Mesquite around us. To the north thunderstorms were brewing as we set out for Maverick Junction, choosing the longer paved route over the rougher and potentially flash flood-obstrudcted Old Maverick Road. 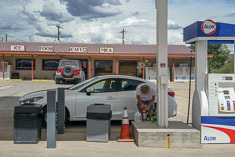 At Study Butte (which turned out to be a town rather than a mountain where research was conducted) we filled up with gas and passed up milkshakes even though the temperature outside was 108F. Ten minutes later we entered the shade of a large storm off to the northeast and the temperature dropped 20 degrees. The mass of dark gray clouds appeared to be sitting exactly over my last birdwatching destination and my last chance for Varied buntings. They had been reported on eBird at the Christmas oasis, which is apparently a private refuge in a remote valley by the Christmas Mountains. We tried to get there nonetheless but the grid of gravel roads, the relics of a stalled development effort to which the GPS directed us, became rougher and more flood prone the farther we went. We would have chanced it anyway if it hadn't been for the storm threatening to move in from the east. 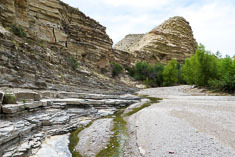 We looped around on better roads and tried to enter from the north but stopped at an unequivocal "NO TRESPASSING" sign and looked for fossils and dinosaur tracks in the sandstone of the roadcut instead. We found some shells. On the way out we birded a half hour in some tall and somewhat trashy mesquite but my Varied Bunting recordings called in only Blue Grosbeaks, once again. We made it as far as Alpine, so named because it sits at about 5000' on a verdant volcanic upland, before stopping for the night. The first four or five restaurants we called were closed for the night but the one we found open, Cafe Reata Alpine, was the best place in town. 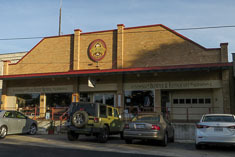 Located in a turn of the century house with southern high ceilings, stucco walls, varnished wood trim and western-themed decor, it felt authentic and the food was great. John ordered a vegetable plate since the menu didn't offer any other vegetarian options. I tried the Poblano chili relleno. Both were excellent. John was up before I was. When I stepped outside I found him sitting on a stool in the vacant lot next door brewing his coffee and contemplating the clouds to the east. The air was mild and the town quiet. 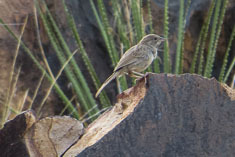 In a weedy corner of the parking lot, a Curve-billed thrasher was thrashing a grasshopper. 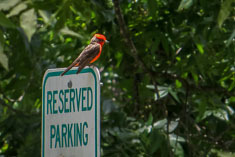 That was about the extent of my bird watching for the day; it was over 400 miles to the airport and we had 10 hours to get there. The drive wasn't that bad. We stopped now and then for photos, left the interstate at Iraan and stopped there for breakfast then continued on secondary roads the rest of the way. 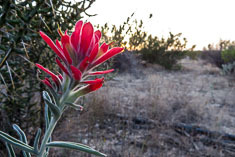 I enjoyed watching plant communities change back from creosote bush and mesquite to grassland to oak and juniper woodlands. 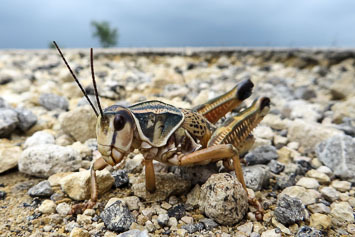 At a stop in mesquite grassland, we photographed giant grasshoppers in the road and I heard a Cassin's sparrow singing. Looking for a Cave Swallow we stopped at a couple of bridges but couldn't detect any. Later, looking at the last photo I took for the trip, I discovered that I'd captured one in flight in the corner of a landscape of a wash. Nice way to finish. I ended up with a list of 103 species for the trip, including life birds 603-605 (Green Kingfisher, Colima Warbler and Lucifer Hummingbird).